A successful picture of people usually requires the eye to be in focus. This is where the viewer's eye will be drawn to. 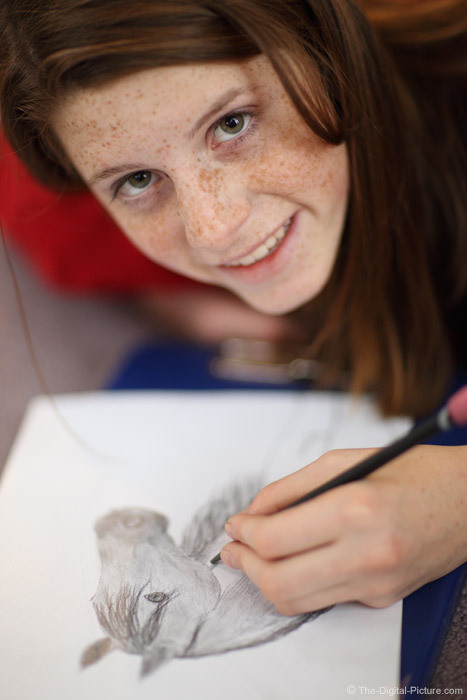 When the picture is of a young artist drawing a horse, try to keep that horse's eye in focus also. This 85mm Lens' ultra-wide f/1.2 aperture combined with the great low light image quality of the 6D means few lighting conditions are inadequate for good image quality. This photo utilized only mid-day ambient indoor light. But, this setup provides only a very thin slice of sharp focus to lay across your subjects. Be very aware of what will be sharp and adjust if necessary.